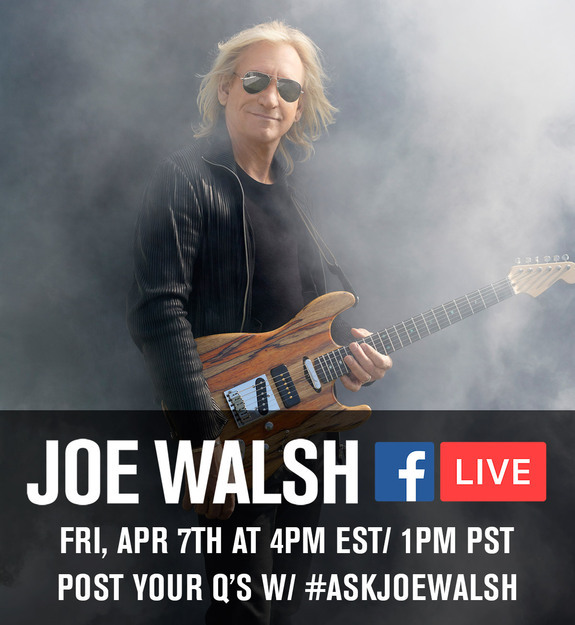 Joe Walsh will be on Facebook Live with his good friend Joe Vitale on Apr 7th at 1pm Pacific Standard Time to answer fan questions! with his good friend Joe Vitale on Apr 7th at 1pm Pacific Standard Time to answer fan questions! That I believe will be at 4pm Eastern Standard Time. Click on this Link to visit the Time Zone Convertor site to confirm time zone time. Click on this line to visit the official Joe Walsh Website. Click on this link to visit the Official Joe Walsh Facbook page.